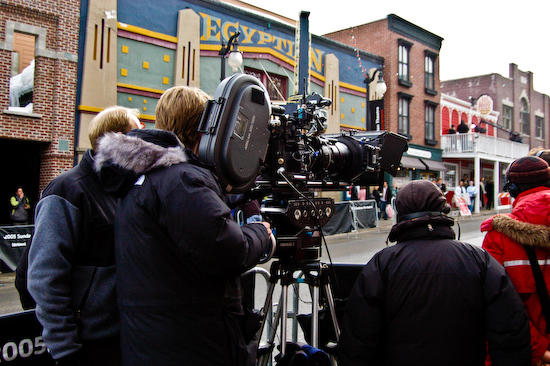 A few years ago, I was in Park City, Utah during the Sundance Film Festival when I passed the film crew for the HBO series Entourage. At the time, I hadn't started to watch Entourage and didn't even know what it was about. I grabbed a couple shots and moved on (later getting a couple pictures of Rita Wilson and Glen Close). This shot shows actually two camera crews - the one in the foreground and a camera on a crane on the balcony of the red building. I haven't seen the episode that this occurs in, so I'm not sure if the crane setup is part of the scene or shooting the scene on the balcony. 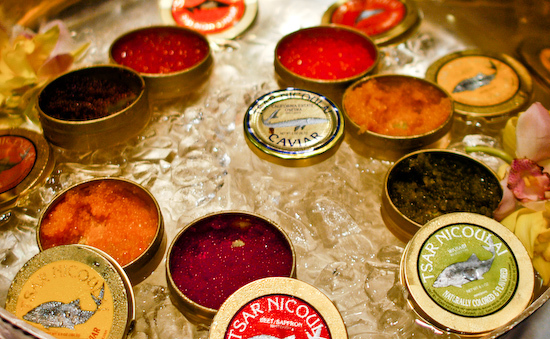 Caviar technically comes from the sturgeon, but many companies label other fish roe as caviar. Each has a distinctive taste (some briney, some fishy, some earthy - all fairly complex) and texture (some crunchy, some mushy). It's always fun to try different kinds of caviar (to compare and contrast). In this case I tasted a variety from Tsar Nicoulai at the Fancy Food Show (they most easily found everyday at the Ferry Building in San Francisco). 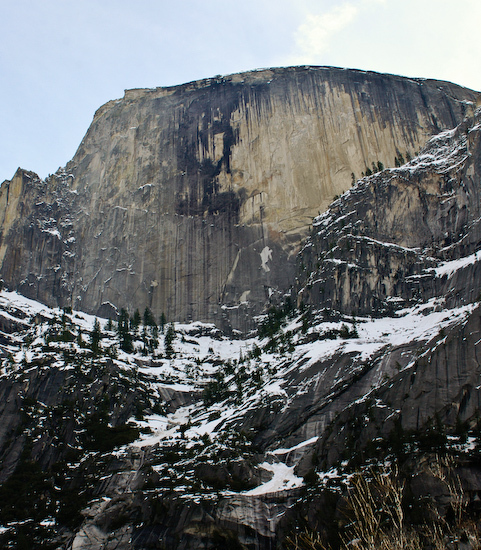 Most of the photographs that I see of Half Dome (perhaps the most recognizable landmark in Yosemite National Park) don't convey just how wide this slab of granite really is. I took this photo from the surface of Mirror Lake (frozen over). A great place to eat in San Francisco is Bushi-Tei in Japantown. Chef Waka (Seiji Wakabayashi) creates Japanese-French fusion haute cuisine while keeping the prices on the low end of the fine dining scale. 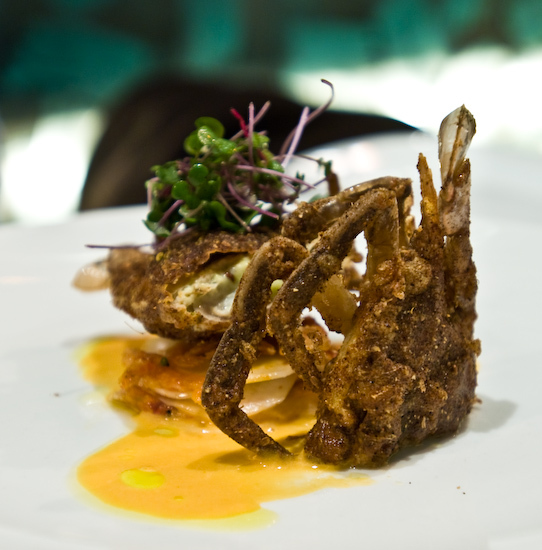 Every dish served tastes ultra-fresh and this soft shelled crab was no exception. 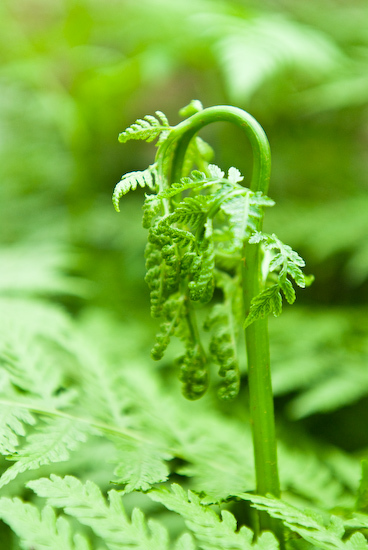 More green… this one is of a fern frond unfurling (say that three times fast!). I took this picture while in a fernery in Christchurch, New Zealand where they have many ferneries and gardens (MANY). Sometimes just because I have a camera in my hand, I'll take pictures of stuff just because it exists. 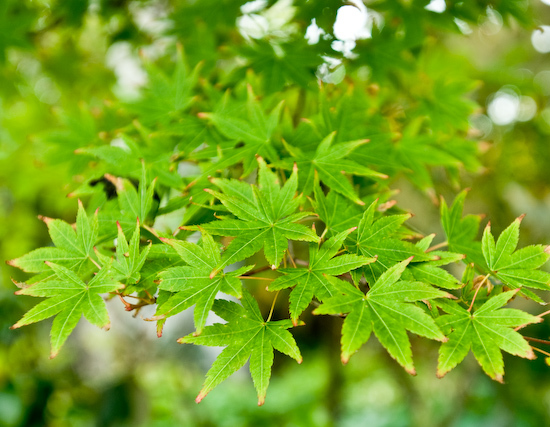 In this case, the maple leaves were green, uniform, and attracted my attention. 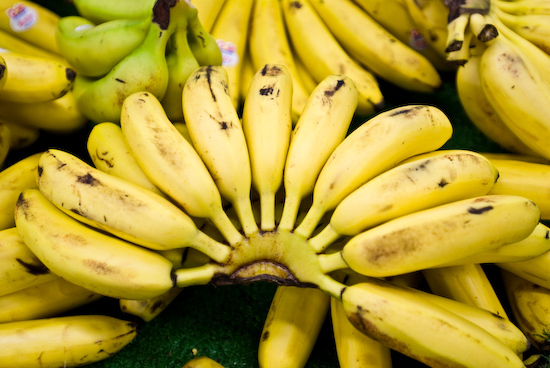 I never really thought of it (especially since bananas in my grocery stores are sold two or three at a time) but I guess bananas grow in circles… I've seen pictures of bananas while they are still on the tree/plant in a giant cluster, but for some reason I didn't think about how they must be connected together to form that giant cluster. I have a lot of photos of the San Francisco Skyline but this is one of a few that I have taken from within the city capturing both the imposing Transamerica Building and the first span on the Bay Bridge. 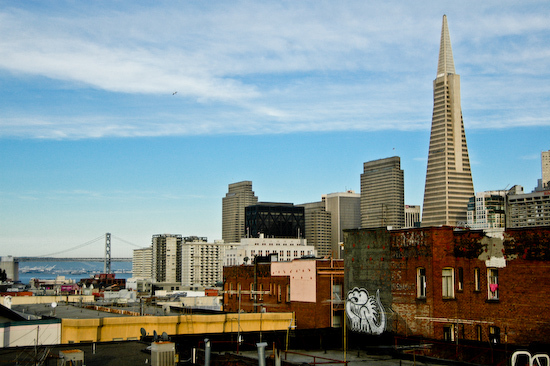 The shot was taken from a rooftop in just north of Chinatown. 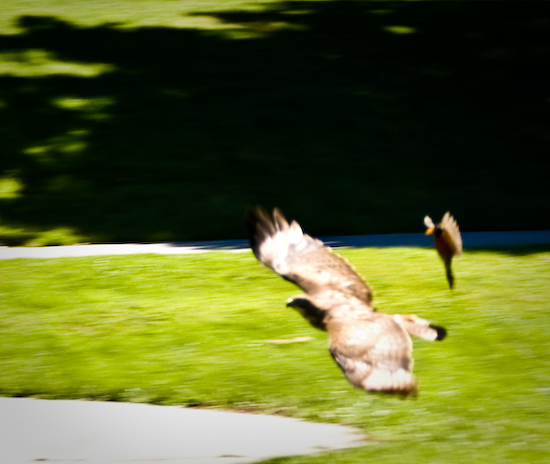 While at a church picnic at Cuesta Park in Mountain View, California, a bunch of us watched a hawk sitting in a tree eating a squirrel. Later, the hawk flew around a little until it was harried by a robin. I grabbed this shot as they flew past. 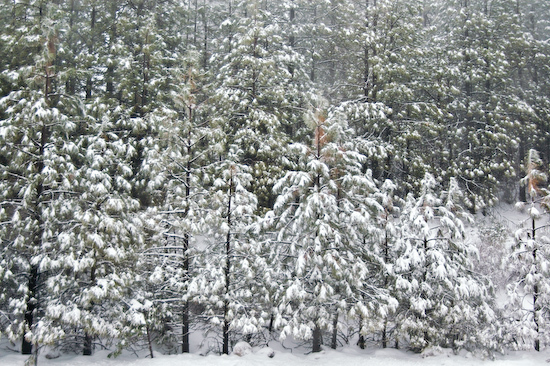 I believe I took this picture while pulled over on the side of the highway waiting for the roads to clear on the way to Lake Tahoe.